Today I came across this beautiful piece of art created by Van Cleef and Arpels, that stopped me in my tracks. This magnificent pendant/ necklace created by one of my favorite brands is inspired by the theme of aquatics and the ocean. The beautiful design is created with diamonds, sapphire and pearls set in white gold and platinum. Besides being an excellent design as a form, and color combination, one must note the interesting use of colors of pearls and the quality of stones which shows forth even from a distance. The evenness, the texture and the symmetry of the pearls make this piece look perfect even within its asymmetric assortment of stones. The diamonds used by Van Cleef and Arpels are no doubt of great quality and the way they are used here, I would not even bother if they were for some reason less than that. One must note the color of the Sapphires. Following the varying sizes of the sapphire, there is an interesting graduation in the color of the sapphire as the design thickens and thins at certain places in this design. The design of this necklace can only be described as 'amazing' in one word. It is asymmetrical and yet confines to a symmetrical form. It is well balanced in the shades of color and texture. It has movement, mobility and yet has a sort of 'calm' look around it. The use of various colors of pearls adds in that interesting element of pale whites which compliments the blue very well. 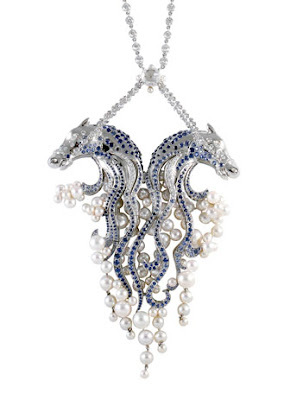 The use of organic stones with such a bold form as sea horses is very captivating. I especially love the way the pearls 'peep' from behind the sapphire trails and the combination of sapphire, pearls and diamonds is a classic anyways. The distance between the pearls maintained by the little metal on the ends of the sea horse' hair' is also very good. Possibly the only thing that did bother me about this piece is the vague element with which it attaches itself to the rest of the necklace. There could have been a more appropriate or creative way to incorporate the pendant into the entire necklace instead of simply 'hanging' it on to a diamond string which also does not look like it belongs to this design. Over all, this is one of those RARE designs that actually made me look twice and I had to do more research on it.